It’s common for companies to start their business on basic bookkeeping software. But as the business grows, they often turn to spreadsheets to begin managing the more complex functions and reporting that accompany that growth. But what some of these companies don’t realize is that those spreadsheets are hurting their business. Here are 4 important reasons why. Data is exported from your accounting software into a spreadsheet. It is then emailed to a data entry clerk or a staff member for input. After the updates are made, it gets emailed to another staff member to review, edit, and format. Repeat this process everyday and several times each week and it’s easy to understand how numbers are transposed, details are inaccurate, and human error wreaks havoc on your business. Consolidating data from multiple business systems creates extra work. It’s inefficient and wastes time that could be spent on more productive activities. 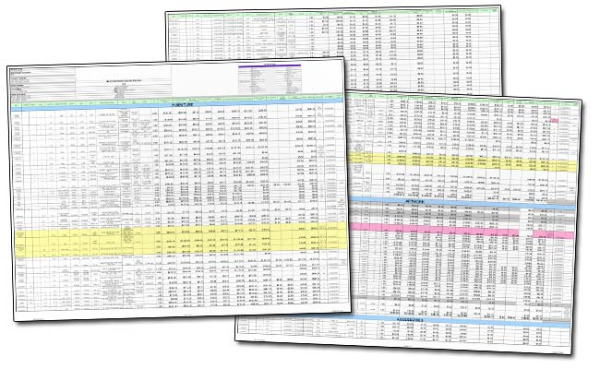 Tracking information in spreadsheets because a business system does not have the required functionality puts dependency on individual users to manage that information. This creates funnels of information across the business. And in order to have visibility to that information, the business is dependent on manual updates of the data into the spreadsheet “reporting”. John emailed the exported data to Jane. Jane then makes her updates and emails it to Jack, copying John. Both Jack and John review the newly updated spreadsheet and make their own edits. John thinks one of the formulas incorporated by Jane isn’t calculating correctly so he emails his updated spreadsheet to Jane with questions. Jane opens John’s edits as well as the version she emailed to Jack and John and attempts to decipher John’s questions. Meanwhile, Jack completes his updates and emails them to Joyce, copying Jane and John. How many versions do we have now? By the time John, Jane, Jack, and Joyce have completed their spreadsheet updates and they are fairly certain it’s accurate, several business days have gone by. It’s month-end and the business has no way of knowing its current performance today without asking John, Jane, Jack, and Joyce to do this again with the latest data, which, of course, would be outdated by the time they were to complete the process again. How is a business able to make data-driven decisions with outdated and inaccurate data? An integrated ERP system offers businesses of all sizes a solution for automating and improving operations. Taking it a step further, integrated ERP and CRM drastically reduces duplication of data entry, provides a complete view of customer information, and streamlines processes through automated workflows. Built-in reporting tools aid in analyzing business data. Imagine being able to access real-time data through dashboards and reports. Real-time BI reporting from an integrated solution equips decision makers with insight into financial and operations performance, allowing them to make innovative and strategic business decisions more quickly and effectively. Instead of relying on outdated systems, leverage technology to improve business productivity. A single, integrated user interface streamlines adoption, is easier to use and manage than specialized, separate systems. Want more information on how an integrated ERP solution can help your business make data-driven decisions that drive growth? Contact Equation Technologies. Our management team has decades of experience helping companies grow their business.